Adhesive Remover LOCA UV For LCD Screen Iphone, Ipod, Ipad, Galaxy S, S2, S3, S4, Note I, II, III. Bottle 240ml ( 8 Fl Oz ) HAVING PROBLEM IN REMOVE LOCA GLUE AND CLEAN THE LCD? . 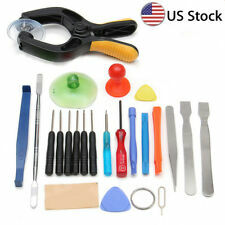 6 x PLASTIC PRY OPENING TOOLS. Safely opens the phone, without damaging the cover. #RMA must be obtained Prior to sending item back. We promise to take care of it, as we strive to ensure you and each and every. 100M Molybdenum Gold Wire Detach Screen Bar to Split Glass for iPhone, Samsung, LG, Sony, Huawey and other's Description: When you use the LCD screen separator machine you do need these tools to help you to separate, which can be widely used in all kinds of screen separator machine in present market. Use your hands directly to separate the LCD screens will hurt the hands. Use detach screen bar to hold metal wire line (cutting line) can protect your hands and it is very easily to split screen for iPhone Samsung Galaxy and other device. .
Each bag have 45pcs. No instruction provided, this repair will require professional soldering skills. 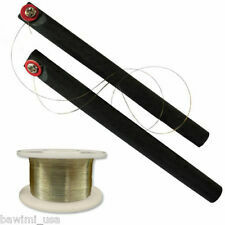 100M Molybdenum Gold Wire Detach Screen Bar to Split Glass for iPhone, Samsung, LG, Sony, Huawey and other's. When you use the LCD screen separator machine you do need these tools to help you to separate, which can be widely used in all kinds of screen separator machine in present market. LCD screen separator machine build-in vacuum pump;. Professional Hair Dryer 1875W Negative Ionic Blow Dryer 3 Heat 2 Speed settings. Pet Puppy Cleaning Brush Dog Cat Hair Foam Carpet Fur Remover Cleaner Brushes US. LCD Separator Machine Plate Screen Glass Repair Kit Removal for iPhone6/plus USA. 1, The worktable to place the separator should be flat and the material must resists heat. 2, Do not let the air blow straight on the plate, otherwise it will affect the heating of the heater. Power 350W. Screen Repair Machine LCD Separator Kit Screen Glass Removal for Galaxy iPhone. LCD Separator Machine Plate Screen Glass Repair Kit Removal for iPhone6/plus USA. 1, The worktable to place the separator should be flat and the material must resists heat. Screen Repair Machine LCD Separator Screen Glass Removal Kit For Galaxy iPhone!! Description: Use this machine to separate the broken glass from the LCD display assembly. The unit heat up the screen assembly to loosen the glue, so that you can remove it with a Molybdenum cutting wire. Heating plate is made of integrative alloy-aluminum with distributed heat conduction, and will stay in shape though under high temperature Power Consumption:320w Max Size:200mmL x 200mmW x 300mmH Voltage: 110V/220V(we will send you the right plugs for your country) Temp. : 50~350 ℃, Dimmable Display: 3 digits Lifetime: 5000-10000hours Package: 1 x Screen Separate Machine. LCD separator Machine Hot Plate for Screen Glass Repair for Cell phone From USA SKU:CP03 Use this machine to separate the broken glass from the LCD display assembly. The unit heat up the screen assembly to loosen the glue, so that you can remove it with a Molybdenum cutting wire. Heating plate is made of integrative alloy-aluminum with distributed heat conduction, and will stay in shape though under high temperature Power Consumption: 320w Max Size:200mmL x 200mmW x 300mmH Voltage: 110V/220V(we will send you the right plugs for your country) Temp. : 50~350 ℃, Dimmable Display: 3 digits Lifetime: 5000-10000hours Package: 1 x Screen Separate Machine. 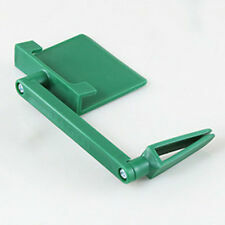 Universal Adjustable LCD Screen Phone Clamp Repair Holder Clip for iPhone Repair. Phone NAND Test Fixture. Universal Plastic Adjustable LCD Screen Phone Tablets Clamp Repair Stand Holder. Universal Adjustable LCD Screen Phone Clamp Repair Holder Stand Fix Support Clip. This is UV LOCA Glue Gun Handle Samsung Iphone LCD Screen Repair. The LOCA gun is used for sticking glass and touch screen. The LOCA gun is used for sticking glass and touch screen. LOCA gun will make your work more easily and conveniently. Universal LCD screen positioned mold LCD Screen Mold Jig Holder. Auxiliary gluing the outer glass lens to LCD, Repair man needs this mold to hold LCD screen when gluing LCD to glass. Phone PCB Holder. 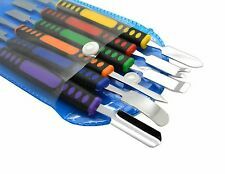 24bit Screwdriver set Opening Tools 3 x Plastic Pry Bar. Color:As the picture show. Size:As the picture show. 3 x Ultra-thin steel pry tool. 1 x 1.5 slotted 1 x T8. 1 x 1.0 slotted 1 x T7. Adjustable LCD screen phone clip repair stand. Used as a fixed clip after maintenance to avoid the separation of the LCD screen from the fuselage. Material: High Carbon Steel. Universal bracket for all phones and pads. FPS Instant Adhesive Remover LOCA UV For LCD Screen Iphone, Ipod, Ipad, Samsung, and Other.. Bottle 240ml ( 8 Fl Oz ) HAVING PROBLEM IN REMOVE LOCA GLUE AND CLEAN THE LCD? . Debonder Instant Adhesive Remover LOCA UV For LCD Screen Galaxy S, S2, S3, S4, Note I, II, III. HAVING PROBLEM IN REMOVE LOCA GLUE AND CLEAN THE LCD?. Bottle with spray Size: 60mL 2oz. Compatible Models: Samsung Galaxy S, S2, S3, S4, Note I, Note II, Note III, and any other screen assemblies without a backlight. PREMIUM LOCA UV GLUE ULTRA LOW VISCOSITY 5 ml FLASHLIGHT UV 9 LED Molybdenum Cutting wire Opening Tools Debonder Glue Remover. 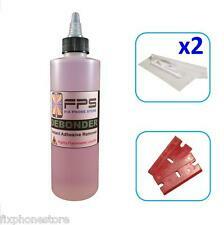 (1) Debonder 60ml Glue Remover. This debonder is used for remove the adhesive that LCD Screen. PREMIUM LOCA UV GLUE ULTRA LOW VISCOSITY 10 ml FLASHLIGHT UV 9 LED Molybdenum Cutting wire Opening Tools Debonder Glue Remover. 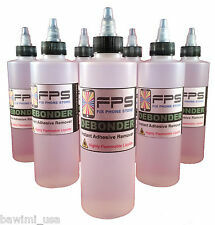 (1) Debonder 60ml Glue Remover. This debonder is used for remove the adhesive that LCD Screen. Debonder Instant Adhesive Remover LOCA UV For LCD Screen Galaxy S, S2, S3, S4, Note I, II, III HAVING PROBLEM IN REMOVE LOCA GLUE AND CLEAN THE LCD? . Gross Weight0.134kg. 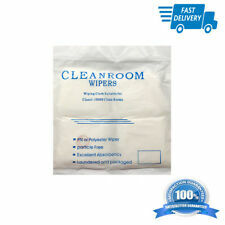 No binders or additives and are manufactured by a proprietary process for low-fiber release and high strength. Specification Voltage: AC 60 HZ Power 350W Temperature Range 0℃ - 400℃ Temperature Display 4 figures Temperature Stability ±1℃ Dimension (mm) 300Lx160Wx120H Weight (kg) 4.9kg Note 1, Must ensure that the machine is grounded well. 2, Do not let the air blow straight on the plate, otherwise it will affect the heating of the heater. Power 350W. LCD Separator Machine Plate Screen Glass Repair Kit Removal for iPhone6/plus USA. 1, The worktable to place the separator should be flat and the material must resists heat. 2, Do not let the air blow straight on the plate, otherwise it will affect the heating of the heater. Name: Freeze Screen Separator Condition: Brand New From Factory Model: ZF-031B Voltage: AC220V (can't use in 110V Power directly, need buy extra transformer ) Power: 2000W Work Temperature: 20-25℃ Separating Temperature: -130 to -140℃ Temperature Range: 0 to -140℃ Weight: about 110 kg.